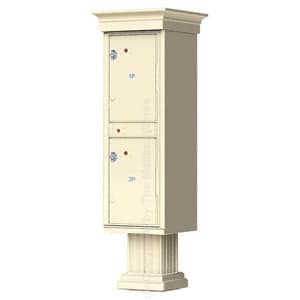 The fashionable Vogue Classic accessories 2 doors kit adds an extra decorative touch plus exterior protection to your freestanding outdoor parcel lockers. All Classic accessories feature 100% die cast aluminum construction and a rugged, weather resistant powder coat finish in 4 matching Florence designer colors. Designer cap and pedestal covers snap into place with self-tapping screws (included) while maintaining strict USPS security guidelines. 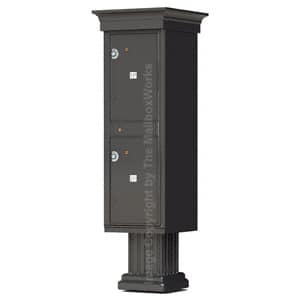 The brand new, redesigned Auth Florence 2 Door Outdoor Parcel Lockers, shown in black, is the highest quality outdoor centralized package delivery unit available. With the growing popularity of online shopping, Outdoor Parcel Lockers 2 doors are the perfect way to increase secure package delivery. 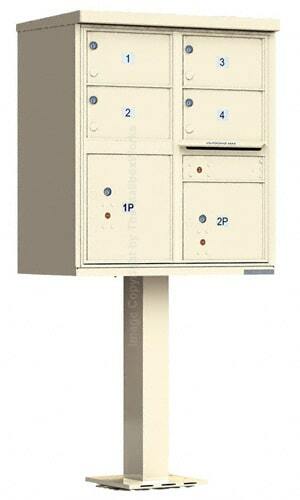 Install parcel lockers (with the Vogue Classic accessories 2 doors kit) with Florence CBU cluster mailboxes. These outdoor apartment parcel lockers are solidly constructed of 300 series stainless steel plus aircraft grade aluminum. Cabinet components and hood seams are robotically welded to provide higher security and superior durability. The tough powder coat finish helps to resists scratching and withstand harsh weather conditions. 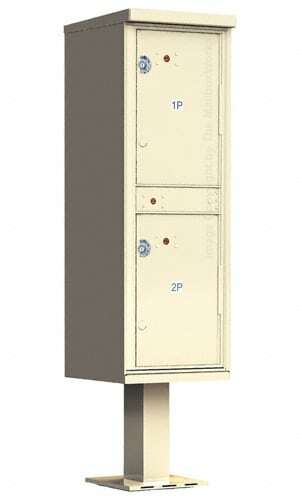 The master loading door of these outdoor parcel lockers have interlocking overlapping seams making it extremely pry resistant. 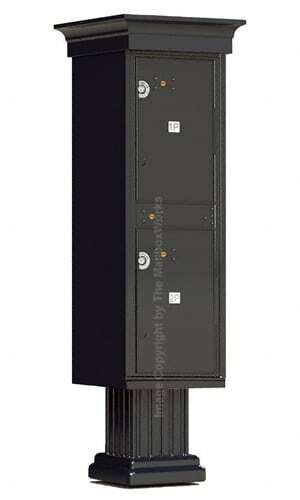 These are large Parcel Lockers designed by Florence Manufacturing to meet the newest F CBU security standards set by USPS. The parcel locker doors come with silver adhesive metal decals with black numbers labeled 1P and 2P. Custom Silver Decals for parcel locker doors can have up to six 7/8″ characters; USPS recommends up to 3 characters. Add custom engraving with up to twelve 3/4″ characters with black or white color fill options. 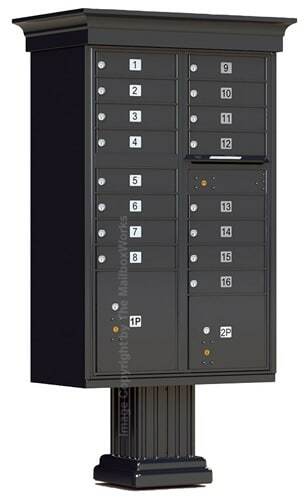 Call us or chat with a customer care rep if you have any questions or need help in ordering Vogue Classic accessories 2 doors for outdoor parcel lockers. Parcel Compartments 19.75" 12" 15"